Նեանդերտալցիների և ժամանակակից մարդկանց տարբերվող գեներն են.ՌՊՏՆ, ՍՊԱԳ17, ԿԱՆ15, ՏՏՖ1 և ՊՍԴ16. Նեանդերտալցիները մարդու ենթատեսակ էին և ոչնչացան խաչասերման պատճառով կրոմանյոնյան մարդու հետ։ (Նեանդերտալցիների խաչասերման թեորիան). ↑ Ghosh, Pallab. "Neanderthals cooked and ate vegetables." BBC News. December 27, 2010. ↑ Such as p.302 of Karl Christoph Vogt, James Hunt, Lectures on man: his place in creation, and in the history of the earth, Publications of the Anthropological Society of London,	Longman, Green, Longman, and Roberts, 1864. 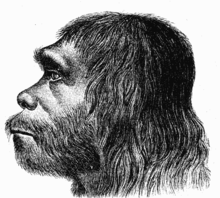 See also the index entry "Neanderthal skull" (only) on p. 473. ↑ Jordan, P. (2001) Neanderthal: Neanderthal Man and the Story of Human Origins. The History Press ISBN 978-0-7509-2676-8. ↑ Эйдельман Н. Я. Ищу предка. М.: "Молодая гвардия", 1970. - 240 с. ↑ Andrei Soficaru u. a.: Early modern humans from Pestera Muierii, Baia de Fier, Romania. in: Proceedings of the National Academy of Sciences. Washington 2006.